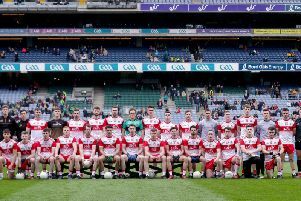 Derry manager Brian McIver admits his side need to banish their ‘Jekyll and Hyde’ tendencies if they are to shock champions Donegal in next week’s Ulster Championship semi-final. The Oak Leafers’ quarter-final victory over Down in Celtic Park was characterised by a controlled, impressive first 35 minutes followed by a disjointed, nervous second half which McIver conceded will not be enough to defeat Rory Gallagher’s team. “I thought we took serious criticism and rightly so for the last 25 minutes of the game against Down but I felt that in the first half we did really, really well,” explained the Derry manager. “We have looked at that. We created a number of chances we didn’t take and the only disappointment from the first half was the fact we weren’t further ahead because we played really good football. But when you are creating chances, well, we didn’t always take them though we were certainly playing well as a team going forward and defensively. The Derry manager said his team would take the lessons of the second 35 minutes but pointed out that experience can only be gained by playing through such circumstances. “One of the things you’re inclined to do when you have a four point lead is just keep the game under control but with an extra man, we really needed to up the ante and kill the game off and we didn’t do that. Despite some pundits questioning the wisdom of scheduling an Ulster semi-final for 7pm on a Saturday evening, McIver says has no issue with the timing and is concerned only with getting the desired result. Given Donegal’s impressive victories over Tyrone and Armagh, the Ballinderry native described his team as “massive underdogs” and said they must concentrate on their own strengths.